some films in Hollywood; 1934—after being detained briefly in Nazi Germany because his third wife was half-Jewish, emigrated to England; 1940–43—worked in the United States. Died: 3 April 1943. "Conrad Veidt," an interview with R. Herring in Close-Up (London), October 1930. Griffithiana (Gemona), no. 38/39, October 1990. Kracauer, Siegfried, From Caligari to Hitler: A Psychological History of the German Film , Princeton, New Jersey, 1947. Allen, J. C., Conrad Veidt: From Caligari to Casablanca , Pacific Grove, California, 1987. Jacobsen, Wolfgang, editor, Conrad Veidt: Lebensbilder: ausgewahlte Fotos und Texte , Berlin, 1993. Gebauer, D., "Conrad Veidt—Dämon, Teufel, Held, Genie—Ein Magier der Leinwand," in Information (Wiesbaden), May 1975. Holba, Herbert, "From Caligari to Hollywood: Conrad Veidt," in Focus on Film (London), Summer 1975. Nau, P., "Notizen zu drei Stummfilmen mit Conrad Veidt," in Filmkritik (Munich), October 1975. "'CI' Salutes Conrad Veidt," in Classic Images (Muscatine), no. 164, 8 February 1989. Caldwell, T., "Some Things You Didn't Know About the Original Caligari ," in Film Threat (Beverly Hills), no. 20, 1989. Battle, Pat Wilks, "Conrad Veidt," in Films in Review (New York), March-April 1993. Battle, Pat Wilks, "Conrad Veidt (Part 2)," in Films in Review (New York), May-June 1993. 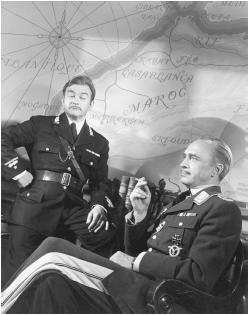 Battle, Pat Wilks, "Conrad Veidt (Part 3)," in Films in Review (New York), July-August, 1993. Wilder, Billy, "Le premier rapatrié de Hollywood," in Positif (Paris), October 1996. Pattison, Barrie, "Ranking the Treasures," in Cinema Papers (Fitzroy), October 1998. Like many of the prominent stars of the great period of pre-Nazi German cinema, Conrad Veidt received his basic training and stage experience from Max Reinhardt, and appeared at the age of 20—just before World War I—at Reinhardt's Deutsches Theater in Berlin. His career in German film began in 1917. Before making his name internationally, in Das Kabinett des Dr. Caligari , he had already been seen in 15 films, two of which, Wahnsinn and Die Nacht auf Goldenhall , he had directed. Veidt's impressive height, handsomely gaunt face, and high cheekbones made him natural casting for sinister or symbolistic roles. He had already played the Button Maker in a film version of Peer Gynt and Death in Unheimliche Geschichten , as well as Phileas Fogg in the silent German film version of Die Reise um die Erde in 80 Tage , before achieving his beautifully mimed and choreographed performance as Cesare, the somnambulist murderer in Wiene's Dr. Caligari , which had originally been intended as a subject for the developing talents of Fritz Lang. Made on the most modest of postwar budgets, this film, with its expressionist-styled sets and theme of insanity, won an international reputation before its proper recognition in Germany itself. It confirmed Veidt as one of the more sinister personalities of German film. He went on to appear (before going to Hollywood in 1927) as Lucifer in Satanas , Dr. Jekyll and Mr. Hyde in Der Januskopf (the characters renamed Warren and O'Connor), Lord Nelson in Lady Hamilton , Cesare Borgia in Lucretia Borgia , and the title roles in Richard III and Lord Byron . Even more prominent from the international point of view, were his performances as Ivan the Terrible in Paul Leni's Die Wachsfigurenkabinett , the lover in Paul Czinner's Nju , in the title role in Wiene's Orlacs Hande , and the lead in Henryk Galeen's Der Student von Prag . He had also extended his range as producer and director as well, with Lord Byron . His initial career in Hollywood, 1927–29, was relatively undistinguished, and he returned to Germany with the coming of sound. Here he was best cast as Count Metternich in Der Kongress tanzt , and in the title role of Rasputin . With the rise of Hitler he took refuge with his Jewish wife in England and eventually took British citizenship. His natural casting was now that of the sinister German, and he appeared in several of the better British dramas and melodramas in the 1930s—Walter Forde's Rome Express and Victor Saville's I Was a Spy , Lothar Mendes's Jew Suss , Berthold Viertel's The Passing of the Third Floor Back , Forde's King of the Damned , and Saville's Dark Journey . In France he made Le Joueur d'échecs before leaving once again for Hollywood. In the short time before he died prematurely of a heart attack in 1943, he appeared in eight films in his usual German roles, most notably in Michael Curtiz's Casablanca . He dropped dead while playing golf at the age of only 50.